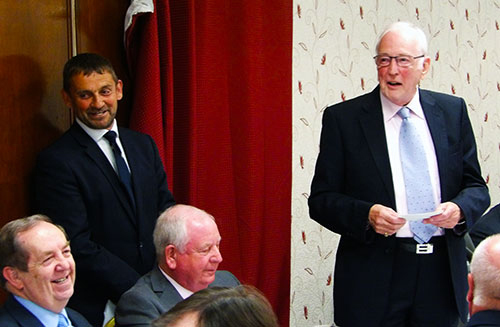 It was a joyous yet melancholy evening for Harry Cox at Cleveleys Masonic Hall when he was principal guest at a dinner to mark his retirement from his position as Assistant Provincial Grand Master. Pictured from left to right, are: Duncan Smith, John Turpin, Harry Cox and Peter Greathead. His five years in the post has been memorable for him and, whilst looking forward to his retirement, he will look back on his tenure with countless happy memories. He has worked tirelessly for the North Fylde and Blackpool Groups and his cheery, outgoing personality has gained him the respect of Masons throughout the Province and beyond. Bulging at its seams, restrictions had to be made on the number attending the dinner. The dining suite at the Masonic hall in Cleveleys can cater for approximately 110 attendees and the demand had vastly exceeded that number. Masons from the North Fylde and Blackpool Groups and others from all corners of the Province had sought tickets. 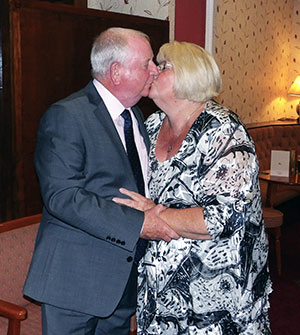 There is little doubt that the numbers wishing to attend would have warranted a venue large enough to cater for a Provincial Grand Lodge meeting – but Harry requested the intimacy of Cleveleys Masonic Hall. Such is the modesty of the man and, as he later revealed, his Masonic career begun at Cleveleys and the hall represented a major part of his grass roots Masonry. Consequently, he felt that Cleveleys Masonic Hall was the only fitting venue in which to bring his tenure as Assistant Provincial Grand Master to a close. A cheery and relaxed mood descended on the hall as the masses assembled for the celebration. Countless fellow grand officers arrived, along with Provincial grand officers and ‘light blue’ brethren – such is the extent of Harry’s popularity. Yes, there were plenty of high ranking Masons but, as would be expected, young fresh-faced Masons were also in abundance. It was an evening at which all ranks of Masonry were present to share in the celebrations. Old and young; highly experienced and raw rookies mingled and chatted as equals. There was a common thread throughout the proceedings; a desire to show admiration and respect for Harry. It was a perfect example of the finest qualities of Freemasonry – one that Harry would fully endorse. The catering was first class. The wine flowed freely and an ambience of sheer joy prevailed. 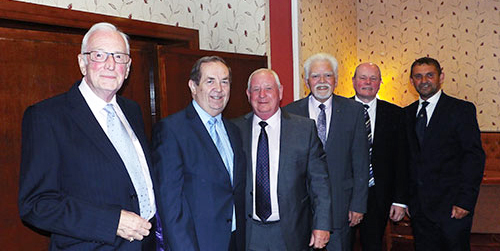 Grand officers and Provincial grand officers were uniformly dispersed amongst newer and younger brethren to ensure perfection of camaraderie – Freemasonry at its best! The formalities of dining concluded, it was time for tributes and speeches. These too preserved the order of joy and relaxation. Assistant to the Provincial Grand Principals and past Chairman of North Fylde Group Duncan Smith proposed the toast to Harry. Providing a brief synopsis of Harry’s Masonic career, Duncan illustrated why Harry is so well respected and admired. 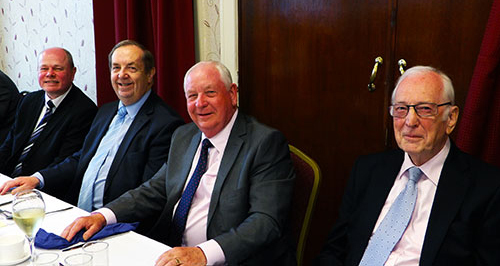 Pictured from left to right, are: John Turpin, David Thomas, Harry Cox and Peter Greathead. Harry was initiated into Anchorsholme Lodge No 5854 in March 1977, having been on a waiting list for four years. 13 years later he was installed as master of the lodge – there were no accelerated promotions in those days. 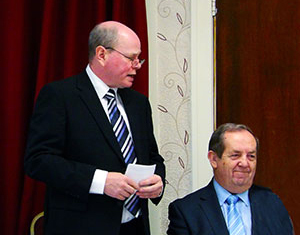 Harry acted as director of ceremonies and secretary of the lodge before being recruited into the North Fylde Group team as secretary, under the chairmanship of Chris Band. In addition, Harry was lodge social secretary for 12 years, Cleveleys Masonic Hall Joint Lodge Committee Treasurer for six years, bookings secretary for the Cleveleys Masonic Hall for seven years, secretary of the North Fylde Group Ball Committee for four years (when numbers in attendance were in excess of 300) and Deputy Captain of Stewards at Provincial Grand Lodge in 2005. Harry is also a grand officer in the Mark Degree and a member of Semper Fidelis Royal Ark Mariners, not forgetting that he is also a past master and past first principal of Senatores Lodge of Installed Masters No 8966 and Senatores Chapter of Installed First Principals No 8966 respectively. He is also a member of Quingenti Lodge No 8516, the Provincial Grand Stewards Lodge. Pictured from left to right, are: Peter Greathead, John Turpin, Harry Cox, David Randerson, Duncan Smith and David Thomas. Expanding on his recollections, Duncan said: “Karen and I have many happy memories of our trips together, with many laughs along the way and I’m sure that they will continue for many years into the future.” He continued by stressing the tremendous support that Carol had given Harry over the years, describing her as ‘an absolute treasure’. As Assistant Provincial Grand Master, Harry has had the responsibility of the Provincial Care System, no easy task during a period of major change and in retirement, is leaving it in a position that is greatly admired by his colleagues at United Grand Lodge and very much appreciated by members of the fraternity. When the standing ovation for Harry had finally subsided, Harry delivered a modest and moving response, thanking everyone for the support and friendship he had received over the years. He was noticeably moved by the tremendous turnout of fellow group officers, grand officers, Provincial grand officers and rank and file members. Sufficient time for another standing ovation to subside had to be allowed before Chairman of North Fylde Group Peter Greathead could bring the formal proceedings to a close, a task he performed with cheery wit and charming grace, qualities that Peter has perfected over the years.